Lavabit launched in 2004 as a free, secure and privacy-conscious email service. It was suspended in 2013 and then reopened in 2017, but is currently only available as a paid service. 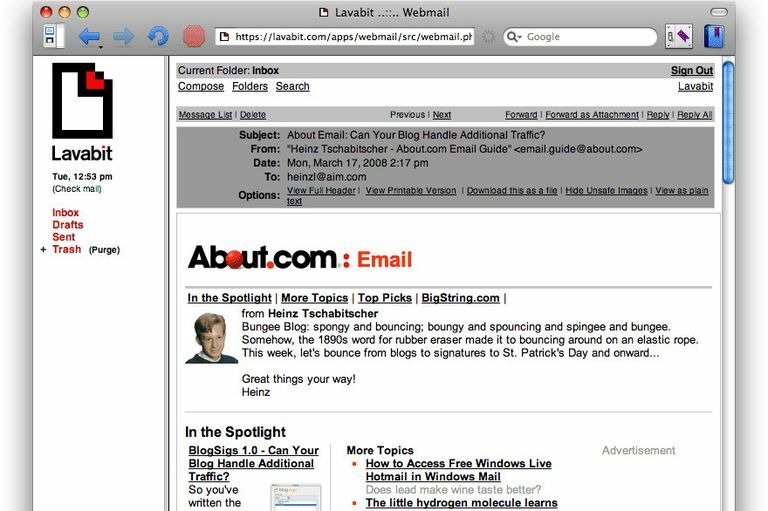 The Lavabit email provider uses the Dark Internet Mail Environment protocols and works over POP and IMAP, as well as through a web interface. Security and privacy are at the forefront of Lavabit's ambition as an email provider. It's commitment to keeping emails private is seen in the fact that the entire company suspended operations for years when it declined to give over private details to the US government. Not only can you connect to Lavabit using encrypted connections and have it scan all your mail for viruses, but messages are also stored in a way that only the password holder can be granted access to the account. The encrypted connection is not just for web access. Lavabit also offers handy POP and IMAP access from your desktop email program, and these connections can be encrypted as well. Lavabit's rudimentary web client interface includes folders and filters and displays emails as plain text or without remote images, by default. However, it offers little comfort or productivity features. You cannot compose mail using rich text or check for spelling mistakes. When it comes to filtering junk mail, Lavabit offers a host of options (from graylisting to DNS blacklists) which you can configure individually if the technical terms don't confuse you. Where Can I Find a Download for Netscape 7.2?